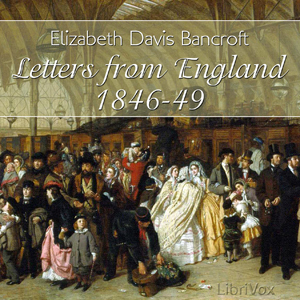 Elizabeth Bancroft went to England with her husband, historian George Bancroft, for three of the most dynamicy years in European hstory. As Ambassador to England from the United States, George moved in the highest circles. In his wife's letters to their sons, her uncle, her brother, and Mrs. Polk (the President's wife), we see glimpses not only of early Victorian English life, but also of Queen Victoria herself! Mrs. Bancroft speaks of dinners with Benjamin Disraeli, visits to Wordsworth, weekends in the country with Louis Napolean and Sir Robert Peel with such matter of fact aplomb that one cannot help being impressed.